Thoracic mobility is crucial for proper pull-up performance, allowing for proper scapular motion, and hence, optimal shoulder movement. 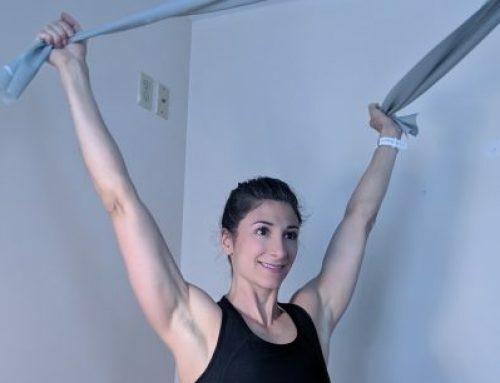 Assessing thoracic mobility and latissimus dorsi length is the first of three assessments to implement when training a client toward independent pull-ups. 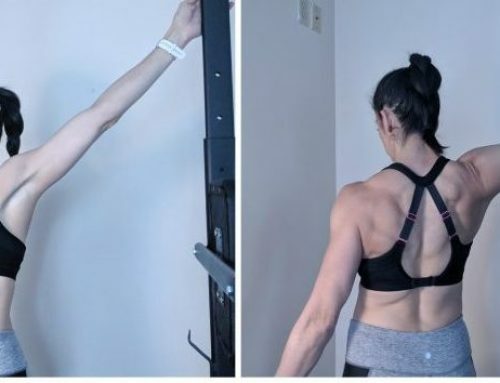 When lats are short and the thoracic spine exhibits hyperkyphosis, the back appears rounded and is often coupled with cervical dysfunction, presenting as “forward head”. This hyperkyphosis is easily assessed at rest. However, someone may still exhibit limited thoracic mobility without appearing to have a rounded back in a static posture. This is when movement assessment is essential. If thoracic mobility is poor, then shoulder mobility is consequently restricted. When the thoracic spine is stuck in a flexed position, it forces the scapulae to abduct and tilt forward. When this happens, the position of the glenoid fossa (cavity of the anterior surface of the scapula in which the head of the humerus sits) is also shifted forward, pushing the entire shoulder girdle and humerus forward. Now visualize what else this does: when the shoulder girdle is pushed forward and compressed, the clavicle is also pushed forward, causing compression of the acromioclavicular (AC) joint. At best, this puts the shoulder complex into a position of functional inefficiency; at worst, expect injuries to occur such as tendonitis, bursitus, torn labrum, impingement, arthritis, etc. If you have noticed your client has a rounded upper back, then he or she will benefit from improving mobility of the thoracic spine. Improving this issue first will make it possible to rectify any further movement dysfunction in the shoulder. Have the client sit on a bench with knees bent and feet elevated on a step. (This locks the lumbar spine into flexion). With hands clasped behind the head, instruct her to extend the spine backwards as far as possible, without extending at the hip or neck. If the spine can’t extend at all or gets pulled forward with the arms in abduction, then lack of thoracic mobility may be restricting shoulder movement. Ideally, the thoracic spine should extend at least 25 degrees. 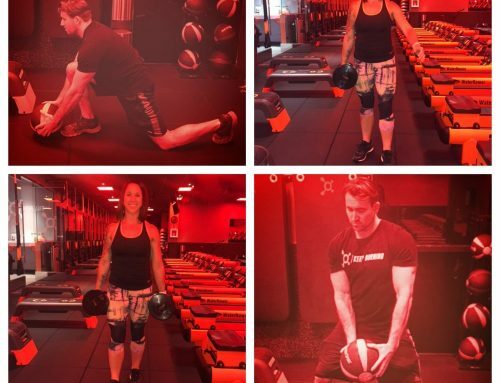 This may be difficult to assess visually with precision, so if it appears the client has a difficult time flexing at all, then she will most likely benefit from mobility work. Instruct the client to lie supine on the ground with legs extended and ask her to bring her arms overhead to reach for the ground. Optimal lat length is measured at 180-185 degrees. If in this position the arms lay on the ground without excessive lordosis, there is adequate shoulder flexion. Adequate lat length if arms reach the floor with straight legs and no excessive lordosis. 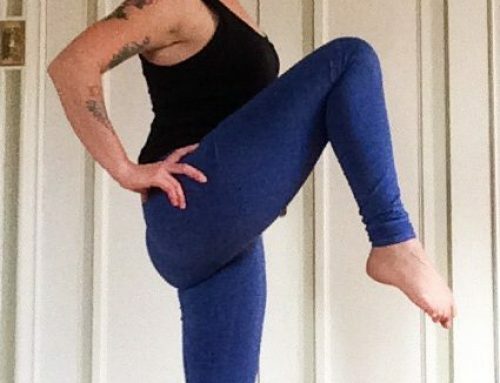 Arms do not reach the floor with knees bend and back flat. If the arms hover above slightly above the ground, then the client has tested positive for restricted shoulder flexion. However, now you must discern if overactive internal rotators are the cause, or just the lats. Instruct the client to bend knees with feet flat (hook lying) slightly posteriorly tilting the lumbar spine into the ground. This places the lats in an even more stretched position, since the lower attachments cross the waistline to the iliac crest. If the arms pop up even more, then it is a strong indication that shortened lats are causing the issue. If they remain in place, then the short internal rotaters need to be addressed. 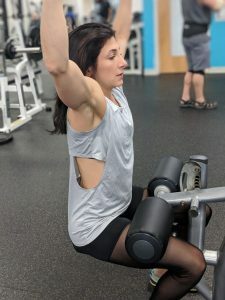 When observing a client during a pull-down, how strict is her form? 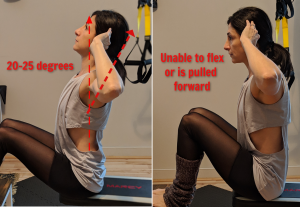 When shoulder flexion is unrestricted, the elbows are fully extended at the start of each rep and the arms should flex enough to be perpendicular to the floor. If the thoracic spine is rounded or lats are short, it is not possible to achieve the above position. If either lats and/or internal rotators are determined to be short and overactive OR the thoracic spine appears restricted (or both! ), then your client will benefit from targeted mobility drills and corrective exercise to lengthen the lats and improve thoracic mobility.